Braking seems fairly simple: you press a pedal and the car stops. If you’re like me, you never really thought twice about how a small motion in your foot can stop an entire car. However, braking systems are elegant, ingenious, and complicated systems. With the help of a few basic principles of physics, the smallest exertion on your part can be magnified into enough force to stop a car. Like so many systems in your car, your brakes run on a hydraulic system. 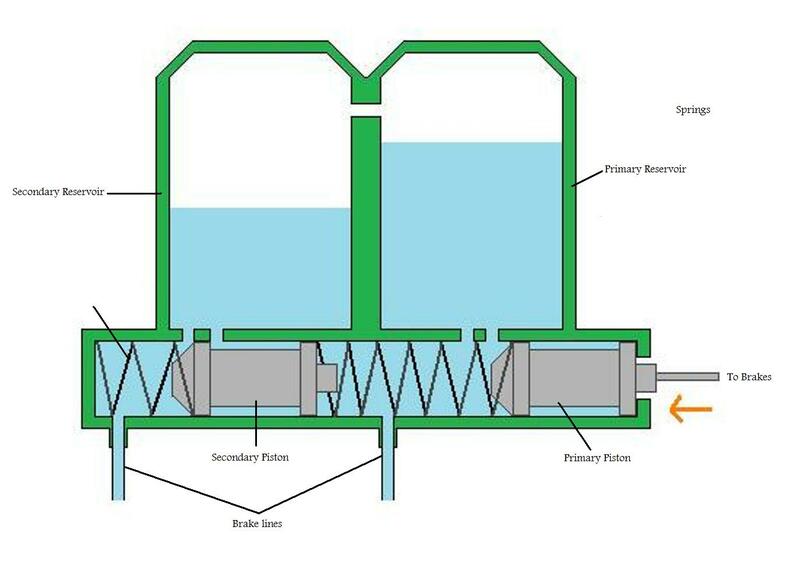 In a hydraulic system, pressurized fluid passes through tubes, cylinders, and the like to transmit force from one place (the pedal) to another (the brake device.) Cars use different kinds of brakes: drum, disc, and power brakes. Many cars use a combination of brakes, with drum brakes on the rear wheels and disc brakes on the front. I’ll discuss each of these different kinds of brakes in detail below. First, however, I want to start by explaining the basic principles that make brakes possible. The force of your foot stepping on the brake pedal isn’t, by itself, enough to stop your car. 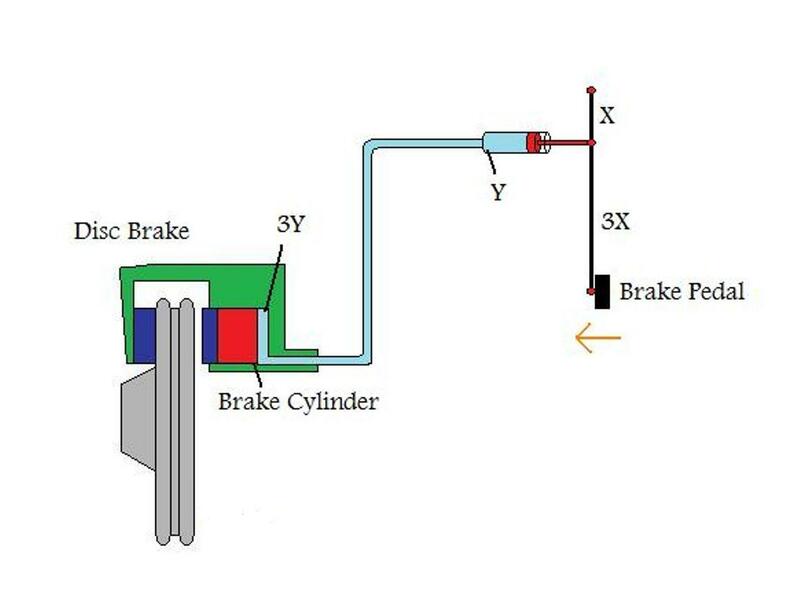 As a result, your braking system needs to multiply the force that you put into the system, so that a greater force will be produced at the braking device. 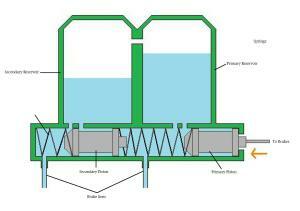 This is accomplished through the application of leverage and hydraulic force multiplication. The brake pedal operates as a lever, a device in which a plank or rod is connected to a pivot. (See Figure 1) When force is applied to the “long” side of the lever, a greater force is produced in the opposite direction on the “short” side. As you can see from the diagram, the increase in force is directly proportional to the decrease in distance. 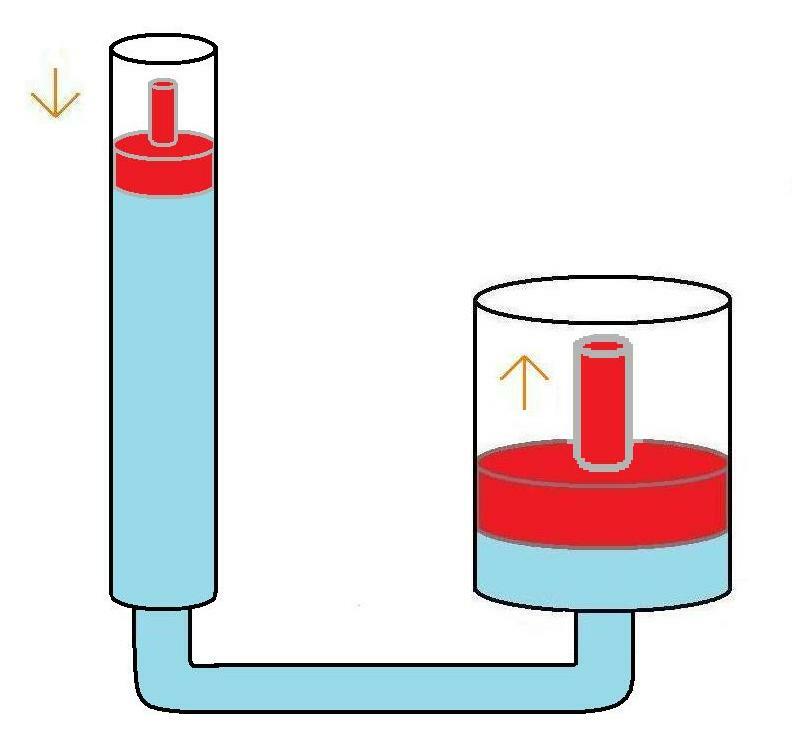 If the long side of the lever is twice as long as the short side, then twice as much force will be produced on the short side. In a car’s braking system, the lever attached to the brake pedal multiplies the force produced by your foot before transmitting this force to the hydraulic system, where the force undergoes further multiplication. When I push the piston on the left cylinder down by a certain amount, the piston in the cylinder on the right will move up by the same amount. 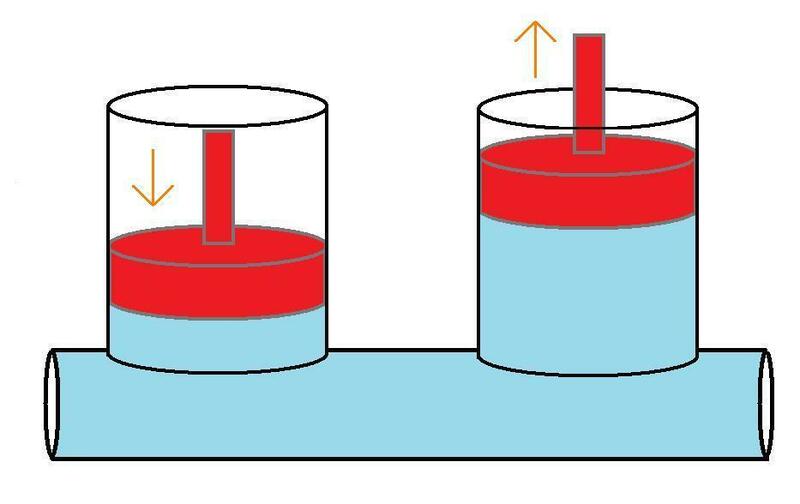 The force is transferred from the left piston to the right piston, although the directions are reversed—a bit like in a lever. 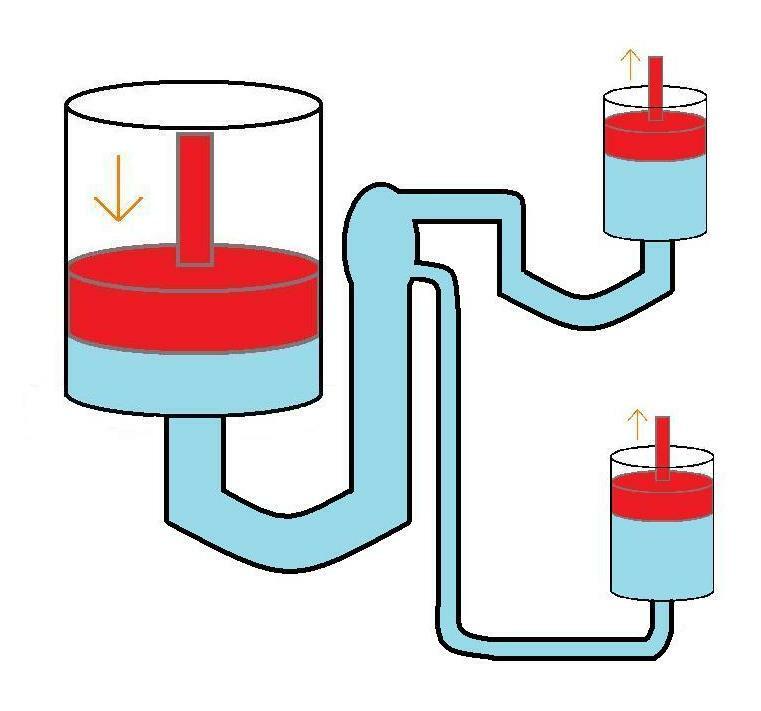 Note also that the pipes or tubes connecting the cylinders can be as long, twisted, and winding as they need to be in order to snake from the brake pedal to the wheels; the force will be transmitted through the fluid just the same. As you can see from the image above, this is accomplished by making the first cylinder much narrower in diameter than the first. 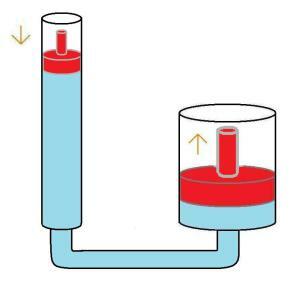 We can depress the first piston to the bottom of the cylinder; however, this will only transmit enough fluid to raise the second piston a fraction of the way up its cylinder. As a result, the upwards force on the right will be much greater than the downwards force on the left. In this system, the distance from brake pedal to the pivot is four times the distance from the piston head to the pivot. (Note that both “outputs” can be on the same side of the pivot, which allows you to have your input and output forces going in the same direction.) This increases the input force by a factor of four. Next, notice that the diameter of the input cylinder, Y, is one third of the circumference of the brake cylinder (output.) This multiplies the force by nine. Taken together, this system produces an output force that is 36 times greater than the input force! Now, how does this force translate into the car stopping? In order to answer this question, we need to look very briefly at a couple other ideas from high school physics. Remember that energy isn’t destroyed; rather, it changes from one form to another. When a car is moving, it has kinetic energy. In order to stop the car, we need to turn this into another kind of energy. The brakes convert the car’s kinetic energy into heat, or thermal energy. They do this by applying friction to an element in the car’s wheels. Friction is the property of objects that makes it difficult (or easy) to slide one thing across another. While many surfaces look more or less smooth to us, all contain roughness at a microscopic level; when surfaces rub together, these microscopic peaks and valleys “catch” against one another, producing heat. The “rougher” something is, the higher its coefficient of friction will be. A car’s brakes contain material that is very “rough,” i.e. has a high coefficient of friction. This allows the brakes to turn kinetic energy into heat energy pretty quickly. 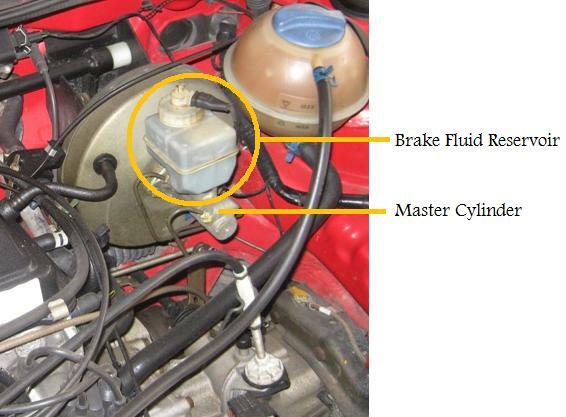 Notice that this system has two reservoirs of brake fluid and two lines going to the brakes. When you push the brake pedal, it applies force to the first piston, which pushes the fluid down the first brake line. The springs then transmit power to the second piston, which pushes the fluid into the second brake line. Now, say that you develop a leak somewhere in the first brake line. This system won’t produce any pressure. However, the first piston will still transmit power to the second piston through the springs, so that the fluid in the second brake line will be compressed. The opposite will happen if a leak occurs in the second brake line. Of course, if there is a leak, your brakes won’t be as effective; you’ll probably notice that you have to push harder on the pedal in order to produce a lesser amount of stopping power. However, your brakes will still function, which wouldn’t be the case without this clever double-barrel design. 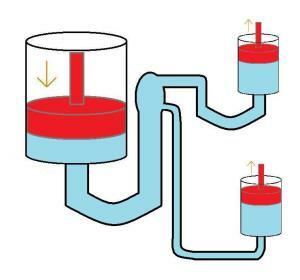 The master cylinder is connected to another complex device called a combination valve. I’ll discuss this a bit later; first, read on to Part 2 of this series to review the two basic brake types: disc brakes and drum brakes. Check out these sites for more information about defensive driving and business driver safety.